What a great opportunity to attend the American Speech-Language-Hearing Association national convention in Atlanta, Georgia! I actually spoke to the creator of “Rock Brain”, Michelle Garcia-Winner. I attended 2 of her excellent sessions on Social Thinking and will be bringing new ideas to our social skills groups. The Short Course that I took was “What is the Script for School? Supporting Academic Success”. After more than an hour of listening to our speaker deliver some very useful information, we took off on a discussion of what we were doing in our schools. Many of the therapists in attendance are actually still finding it difficult to collaborate in the classroom. I left that discussion with renewed appreciation of my school. There was lots of learning and lots of fun! Not all of our students in need of social skills training are at the same level of functioning. 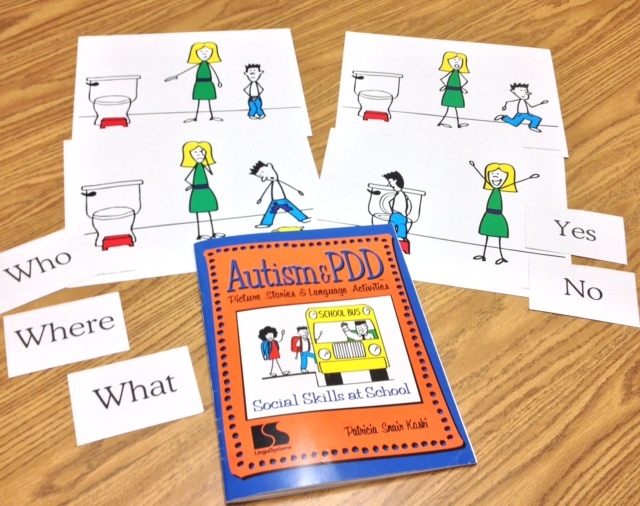 Some of our students respond well to those wonderful Matt and Molly stories by Patricia Koski published by LinguiSystems as Autism & PDD Picture Stories & Language Activities. The stories are simple and concrete. Patricia Koski writes, “the routine and structure of this program, as well as its familiar characters, reduce students’ anxiety. Decreasing anxiety facilitates more compliant behavior, which incrases the amount of learning time. Each story is told through four pictures. Students see and hear that “if I act this way, it’s wrong. If I act this way, it’s right”. Yes/No questions and a variety of WH questions give students the opportunity to practice receptive and expressive language skills. We never get tired of Matt and Molly! Anyone walking by Room 99, AKA the speech room, would probably say, “Is there a party going on in there?” or “all they do is play games”. It is true. We love to party and we love our games. 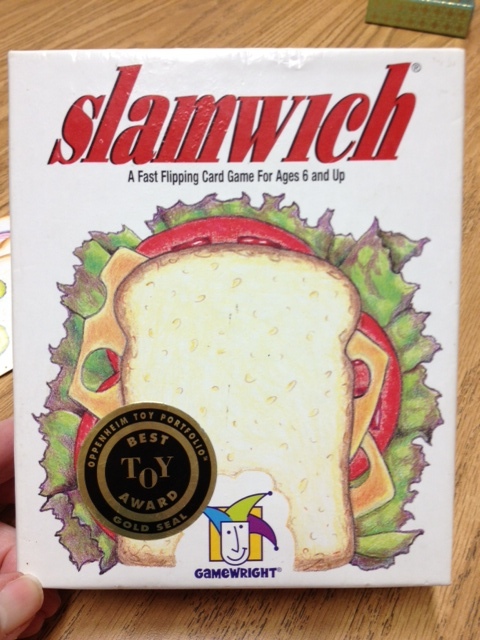 Slamwich is one of our favs. 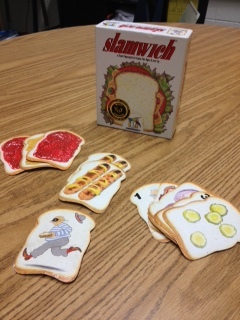 When you play Slamwich you must have your “brain in the group” and your “body in the group”. Our #1 rule is NO PEEKING AT YOUR CARDS (it is sooooo hard). When you run out of cards and really want to get back in the game it helps to use coping strategies Positive self-talk such as “that’s ok, if I really stay focused I will get a chance to get back in the game”. This game also gives players the chance to encourage their friends with nice words. Yes, anyone walking by Room 99 will hear fun and laughter. We like this approach to social skills training. It works! Just bought the new app from Smarty Ears- Social Quest. I am always on the lookout for ways to make social skills training fun and this app looks to fill the bill. The price is great-$14.99 special through 11/10. I like this but that doesn’t always mean my students will! I will let them write a review later. 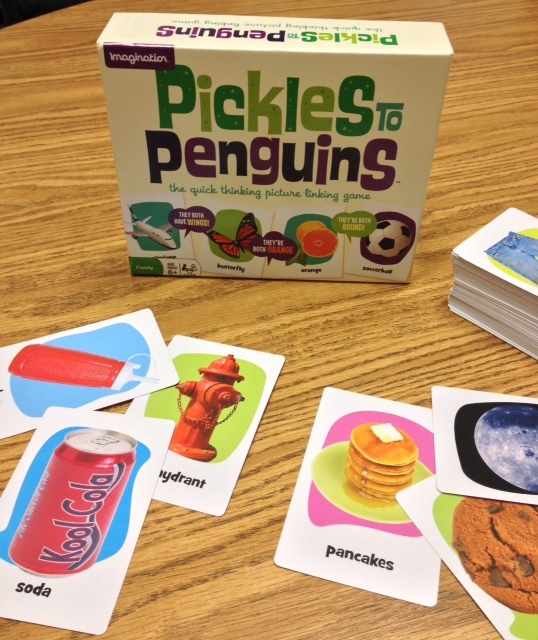 Today we combined 2 great ideas from Jenna Rayburn over at SpeechRoomNews. The Bazinga board is such a versatile game board. 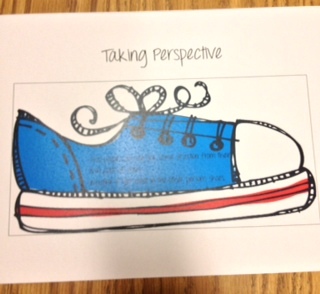 In Your Shoes is a perspective taking activity. 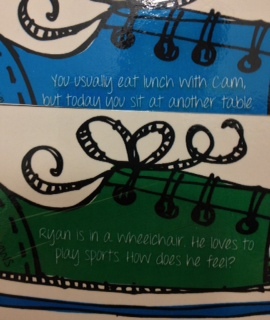 On each “shoe” card is a question or scenario that requires the student to think about what another person might be thinking or feeling. 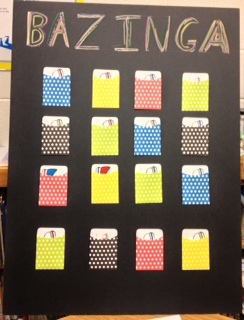 I placed a “shoe” card in most of the polkadot envelopes on the Bazinga board. 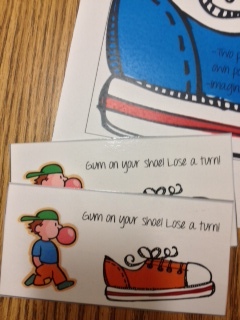 A couple of “Gum on your shoe lose a turn” cards were inserted into envelopes. Sometimes losing a turn means you have to use a coping strategy. 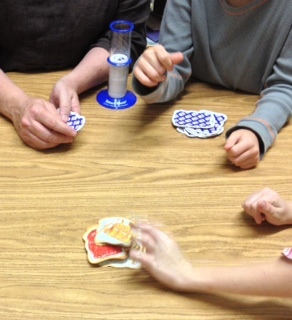 Today “positive self-talk” was used to help a student who felt disappointment at losing a turn. He said to himself “that’s ok, I will get another turn”. 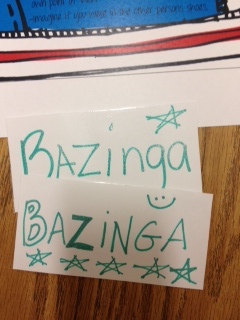 I made up a couple of “Bazinga” cards. If you pick one of these you get extra popcorn. Thanks, Jenna, your visuals make our socal coaching experiences more fun! !